These potatoes are roasted in the oven and then dressed with a sublime lemon and olive oil emulsion. They are so good, they could be eaten as a main dish. But we like them with roasted chicken. 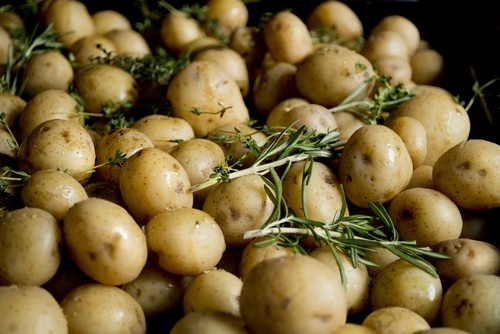 Toss potatoes, 1⁄4 cup oil, salt, pepper, and garlic on a foil-lined baking sheet. Roast, tossing occasionally, until browned and tender, about 35 minutes; transfer to a serving bowl and keep warm. Purée remaining oil, 1⁄2 teaspoon salt, and the lemons(rind and all) in a blender until smooth. Pour through a fine-mesh strainer over potatoes; toss to combine. This sauce is so good, you can make extra to pour over chicken, fish, shrimp, rice or noodles. You can also add it to marinades.